NATO Secretary-General Jens Stoltenberg told me he reassured Montenegro after President Trump publicly questioned whether it was worth it for the United States to defend the tiny NATO ally if an enemy attacked. "I have reassured Montenegro," Stoltenberg told me in an interview on Friday, "and I also know that the United States has clearly stated that they are fully committed to Article 5 and NATO and the collective defense." Why this matters: NATO's foundational principle is that an attack on one member country is an attack on all. America's willingness to honor that commitment provides the security blanket that keeps the transatlantic alliance alive. But in a July interview, Fox News host Tucker Carlson asked Trump why his son should "go to Montenegro to defend it from attack?" "I understand what you're saying; I've asked the same question," Trump replied. "You know, Montenegro is a tiny country with very strong people. ... They are very aggressive people. They may get aggressive, and congratulations, you’re in World War III." Trump was criticized at the time for — perhaps unwittingly — echoing a Vladimir Putin talking point. I asked Stoltenberg whether he agreed with Trump's assessment that Montenegrins are "very aggressive people." The NATO leader smiled wryly. "Montenegro is a very welcome ally of NATO," he responded. "I've been in Montenegro many times ... when I was a child ... we went to Montenegro many times, and I have a good relationship to many Montenegrins." You can read the rest of my interview with Stoltenberg here. It's a case study in how carefully the NATO leader chooses his words so as not to offend Trump. 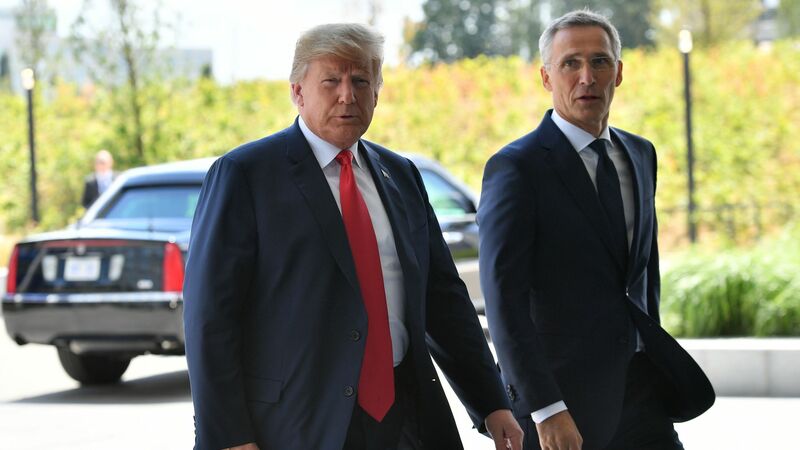 Stoltenberg on Trump: "I fundamentally believe that he is committed to NATO because that's what we see when I see actions on the ground by the United States." On whether he was worried about NATO members — such as Poland, Hungary and Turkey — sliding toward illiberalism, Stoltenberg said his hands were tied, given that NATO doesn't have a mechanism for punishing wayward members. I asked him whether a Russian cyberattack on a NATO member would trigger Article 5 (NATO's collective defense provision). "Not automatically. It depends on the character of the cyberattack," he said. "We will never be specific on when we trigger Article 5." I also challenged Stoltenberg on whether Trump deserves as much credit as he has given him for NATO members increasing their defense budgets. He said Trump does deserve a lot of credit.